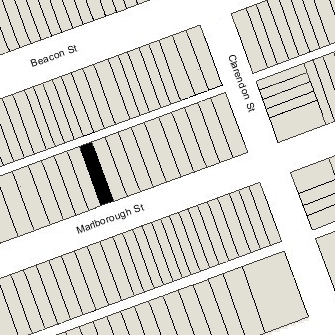 121 Marlborough is located on the north side of Marlborough, between Clarendon and Dartmouth, with 119 Marlborough to the east and 123 Marlborough to the west. 121 Marlborough was built in 1877 by J. and H. M. Harmon, builders, for Charles William Freeland, one of seven contiguous houses (121-123-125-127-129-131-133 Marlborough) built for him between 1877 and 1880, all in the same design and built for speculative sale. 121-123 Marlborough were built first, with the original permit application for the two houses dated March 3, 1877. Click here for an index to the deeds for 121 Marlborough. On November 1, 1877, 121 Marlborough was purchased from Charles Freeland by the estate of former US Supreme Court Justice Benjamin Robbins Curtis to be the home of his widow, Maria Malleville (Allen) Curtis. Prior to her husband’s death in September of 1874, they had lived at 21 Marlborough. Benjamin and Maria Curtis’s son, Allen Curtis, a stockbroker, lived with her until about 1887, but had moved to 277 Clarendon by the 1887-1888 winter season. Maria Curtis continued to live at 121 Marlborough during the 1892-1893 winter season, but moved thereafter. On July 8, 1893, 121 Marlborough was purchased from the estate of Benjamin R. Curtis by Helen E. (Skelton) Cary, the widow of Richard Cary. Their daughter, Georgina S. Cary, lived with her. They previously had lived at 38 Chestnut. Richard Cary had been killed in August of 1862 at the Battle of Cedar Hill (Virginia), while serving as a Captain in the Union Army. Helen Cary died in September of 1904. 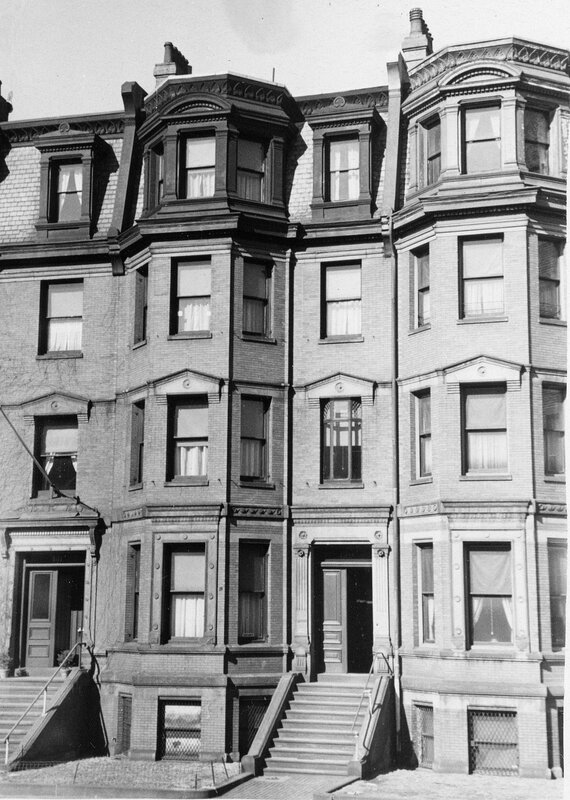 Georgina Cary continued to live at 121 Marlborough until her death in January of 1933. She also maintained a home in Dublin, New Hampshire. On June 14, 1933, 121 Marlborough was purchased from Georgina Cary’s estate by Miss Mary Buckminster Lothrop. Her brother, attorney Thornton Kirkland Lothrop, Jr., lived with her. They previously had lived at 152 Mt. Vernon, and prior to that at 27 Commonwealth with their widowed mother, Anne Maria (Hooper) Lothrop, until her death in July of 1930. Thornton Lothrop died in September of 1945 and Mary Lothrop died in October of 1946. The house was shown as vacant in the 1947 City Directory. On June 5, 1947, 121 Marlborough was acquired from Mary Lothrop’s estate by Susan Edith (Waterbury) Weld, the widow of Stephen Minot Weld, Jr. Mary Frances (Blodgett) Nye, the widow of Theodore Herbert Nye, lived with her. They both previously had lived at 159 Beacon. Susan Edith Weld died in September of 1960. 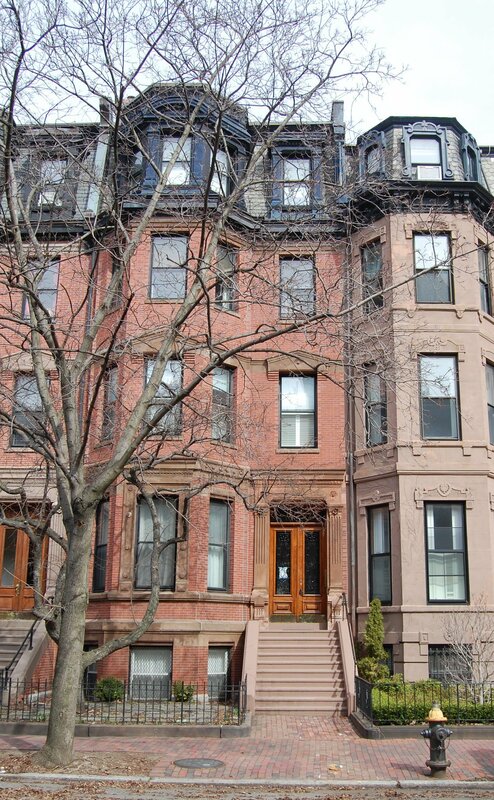 159 Marlborough was inherited by Mary Nye, who continued to live there until her death in September of 1972. On April 11, 1973, 121 Marlborough was acquired from Mary Nye’s estate by Anthony P. Baker. In December of 1973, he applied for (and subsequently received) permission to convert the house from a single-family dwelling into nine apartments. He abandoned the permit, but may have proceeded with some remodeling nevertheless. On October 2, 1975, the Stephen Finance Corporation (Alton G. Cherney, president and treasurer) foreclosed on its mortgage to Anthony Baker. On November 25, 1975, 121 Marlborough was acquired from the Stephen Finance Corporation by Architectural Renovations Incorporated (Peter K. Gearhart, president and treasurer). In March of 1976, it applied for (and subsequently received) permission to convert the property from a single-family dwelling into five apartments, which it indicated was an existing condition. On November 10, 1976, Architectural Renovations converted the property into five condominium units, the 121 Marlborough Condominium.